1. Strong Environmental Track Record: Eric doesn’t just talk a good talk, he gets results. Check out hist long list of environmental accomplishments. 2. Leadership: Eric took the lead as Council President, a job that not only tested him as a leader, but will prepare him well in his role as Mayor. 3. Neighborhood Focus: Eric worked to improve the quality of life in all of the neighborhoods in his 13th Council District (I’m a resident of one of those, Echo Park). I’m super excited about the soon to be opened and restored Echo Park Lake! 4. Coalition Building: Eric has built an impressive campaign for mayor, uniting a broad cross section of people and institutions. He used the same approach to get things done in his district. 5. Bicycling Support: I worked closely with Eric and his staff when I directed the Los Angeles County Bicycle Coalition. Eric has a great line in this video my friend George made from the most recent CicLAvia. (lots of other local superstars in this video as well). 6. Engaging Angelenos: Before the primary, Eric’s campaign asked if I could facilitate some salons with various local leaders to generate ideas on issues related to water, energy, community development, transportation and education. This innovative, engaging approach generated ideas that helped him develop his agenda as mayor. 7. Grassroots Support: Related to engaging Angelenos, Eric and his campaign have walked the streets of Los Angeles talking and listening to voters. His people-powered campaign reflects the diversity of Los Angeles. 8. Immigration Reform Support: He cares about this issue and has served as an advisor to President Obama. 9. Creative Solutions: In the recent debate at USC, Eric mentioned Driverless Cars as a potential transportation solution, a technology with enormous potential to transform our streets. 10. Love for Los Angeles! : Like me, Eric is from here and loves it. The passion he has for our fair city and his understanding of our past and present will equip him as he engages all of us to participate in creating our own civic future. Remember to vote on May 21st. 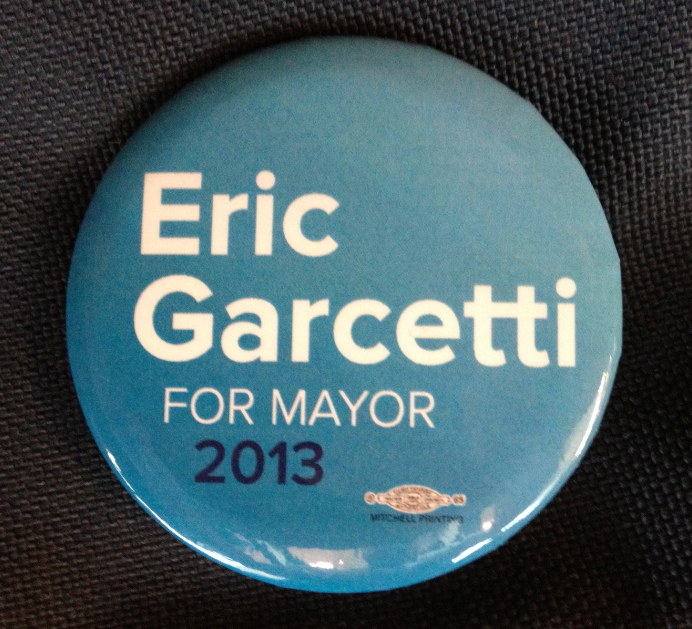 I encourage you to vote for Eric Garcetti. If you’re planning on voting for Eric, I’m curious to hear why you support him. Thanks! This entry was posted in Sustainability and tagged Community, Leadership, Sustainability. Bookmark the permalink.